Installation requires only basic DIY skills. Simply wrap the coils around the main water pipe, fix the descaler to the wall, plug in the ac/dc adapter and switch on. Location: Position your descaler as close as possible to where the mains water supply enters the house; just after the main stopcock. This ensures maximum coverage. If this is not possible, see our guide on where to locate your descaler. Having selected a suitable location to fit the descaler, start by wrapping the induction coils around the pipe. The details of this	depend on the model of descaler. For the DSC1, fix the end of one of the induction coils to the pipework using a cable-tie. For 15mm pipework, wrap the cable around the pipe a minimum of 12 times and fix in place using a second cable tie. More turns will create a stronger electromagnetic field in the pipework, but shorten the amount of cable left to attach to the descaler unit. The table below shows the amount of	cable used and the amount remaining for a given number of turns. Fit the second coil in a similar manner to the first, leaving a 3cm gap between the two cables. 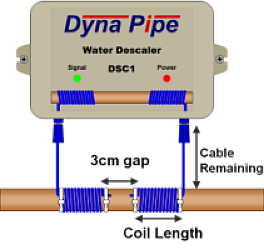 To fit the DSC2 water descaler, start by using a cable-tie to fix the end of the induction coil cable to the pipework. Leave 32 or 33cm (see table below) to one side of the cable tie and the remaining 138cm or 137cm on the other side. Make the coil by winding the long end of the cable around the pipe and fix the end with a second cable-tie to stop it unwinding. The table below shows the number of times to wrap the cable around the pipe. These are the minimum number of turns. More turns will create a stronger electromagnetic field but shorten the amount of cable left to attach to the descaler unit. For all descalers, the single most important factor when winding the coils is to make sure they are wound as tightly as possible. This will ensure the maximum possible electro-magnetic field. Loosely wound coils will not operate as intended and may fail to reduce the level of limescale. Next, attach the descaler unit to the wall, making sure it is close enough to attach to the coils. Finally, insert the two coil connectors into the sockets marked A and B, plug in the ac/dc power adapter and switch on. The induction coils can be wound clockwise or anti- clockwise, but whichever direction you choose, its very important to wind the coils as tightly as possible. How long is the cable from the mains adaptor? Check our FAQs. 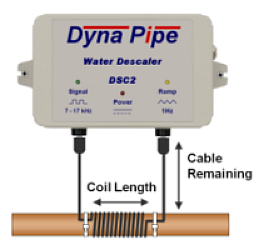 Do I need a plumber or electrician to fit the descaler? Check our FAQs.